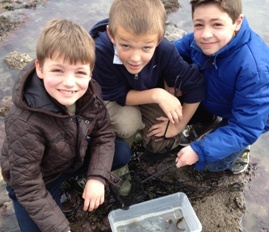 Take your class out on the beach where they can discover and take home their own fossils with our trained Wardens. The session starts at the Centre with a short film show entitled “Finding Fossils at Charmouth”, followed by a warden talk around the fossil touch table with top tips on what to look for and how to find it! All relevant health and safety information is given to the children before heading out onto the beach accompanied by the warden to look for fossils. 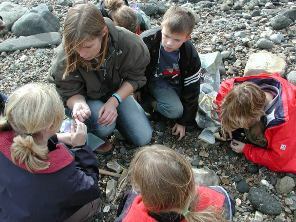 All finds during the day can be taken back to school or home at the end of the session. We advise you to bring a small freezer bag for each child to put their fossils in. Take a ramble over the rocks to discover the weird and wonderful plants and animals that live on our seashore and how they have adapted to living in this challenging environment. The group meets the Marine Warden at the large metal anchor by Cobb Gate car park, Lyme Regis before a short walk takes you to the site of Broad Ledge. 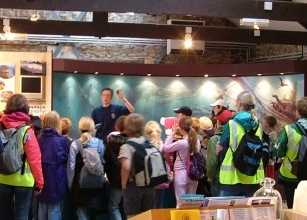 All relevant health and safety information is given to the children before heading out onto the rock pooling area. All necessary equipment is provided by the Centre. 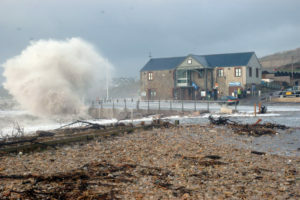 What makes a coastline, who uses it and what can we see? Using the beach area at Charmouth, how do we use the coastal environment and what natural processes affect it? Coastal mapping, eroding sandcastles, what makes a wave and beach profiles. All relevant health and safety information is given to the children before heading out onto the beach. All necessary equipment is provided. The Fossil Film Show and Warden Talk gives an overview of the geology of the World Heritage Site ‘Jurassic Coast’. We focus on how fossils are formed and the types of fossils that can be found on Charmouth beach. There are two versions of the film show available depending on the age of the children. The film is followed by a Warden talk around the fossil touch table, where the children are shown real specimens that have been found on the beach with information about how these creatures would have lived in the Jurassic seas. Please Contact Us to book your visit.